The workforce accommodation leader saw shares cool off from all-time highs. 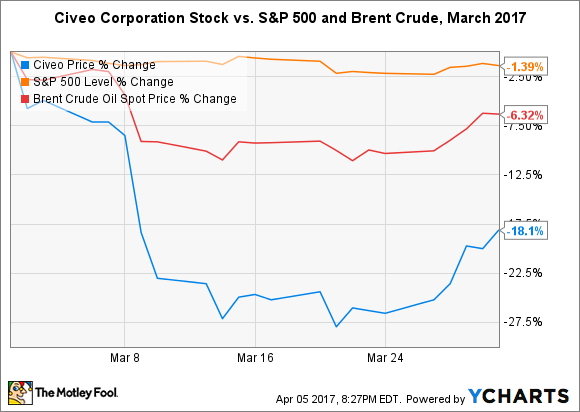 Shares of Civeo Corporation (NYSE:CVEO) dropped more than 18% last month, following a 6.3% decline in crude oil prices in March. For reference, shares began the month at an all-time high near $3.50 apiece. The integrated provider of remote workforce accommodations piggybacks on the growth of the mining and oil gas industries in Canada, the United States, and Australia. When natural resource extraction and pipeline construction is booming, the company's business follows suit. However, the reverse is also true. The pullback in oil and gas investment in recent years and steady decline of coal production hit the business hard. Therefore, investors worry that any downturn in crude oil prices jeopardizes future demand for the company's services and its ability to recover from its multi-year slump. While month-to-month jitters are a little over the top from a long-term investing point of view, Civeo Corporation doesn't have much room for error. The $380 million company reported a staggering $337 million in long-term debt at the end of 2016. It also saw revenue drop 23.3% from the year-ago period and reported a net loss of $0.90 per share. Given the difficult market conditions in recent years, it's not surprising that the stock is familiar with volatility. But there's some good news as well. A $65 million stock issuance in February was used to pay down debt levels. Management has also managed to cut selling, general, and administrative expenses 22% since 2014. The biggest boon to business in the near term may be an expected uptick in shorter cycle business, or lodging required for shorter-term projects such as remote rig installation or pipeline building. Consider that in 2014 Civeo Corporation generated roughly $225 million from shorter-cycle business. That dropped to just $50 million last year. While management hasn't provided expectations for when that business will recover, improvements in drilling and completion technology have dramatically shortened the duration of well installation in recent years. That could hurt the chances that the company sees a return to historical revenue levels. Then again, at just $50 million, any upside would be welcomed. Despite the headwinds, investors continue to bet on the future of Civeo Corporation, as evidenced by recently established all-time highs -- even if they feed into volatility and uncertainty from time to time. The stock has only been publicly traded since mid-2015, but the balance sheet is clearly improving and management is optimistic about the future. If natural resource extraction rates recover to historical levels, then the company's business could be in line for a major windfall. But that may prove more difficult than investors currently anticipate. David and Tom just revealed what they believe are the 10 best stocks for investors to buy right now... and Civeo wasn't one of them! That's right -- they think these 10 stocks are even better buys.